Eschew the tourist crowds and head to Murales de Diego Rivera en la Secretaria de Educacion Publica and Museo Memoria y Tolerancia. 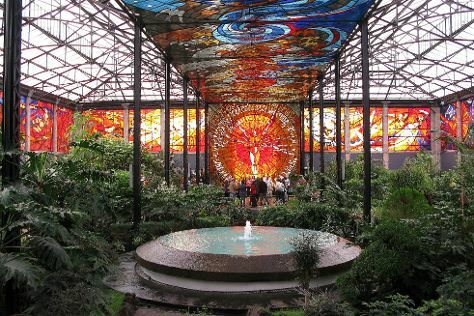 Take a break from Mexico City with a short trip to Cosmovitral Jardin Botanico in Toluca, about 1h 20 min away. Next up on the itinerary: delve into the lush surroundings at Chapultepec Park, indulge in some culinary diversions at a local gastronomic tour, get in on the family fun at Six Flags Mexico, and take a stroll through Ciudad Universitaria. To see maps, other places to visit, photos, and more tourist information, you can read our Mexico City online route planner . If you are flying in from United States, the closest major airports are Licenciado Benito Juarez International Airport, Querétaro Intercontinental Airport and General Francisco J. Mujica International Airport. June in Mexico City sees daily highs of 76°F and lows of 57°F at night. Finish up your sightseeing early on the 30th (Sat) so you can travel back home.